Grande Vegas Casino says its players are just loving its new mobile casino games so it's committed to adding as many more as quickly as possible. The latest is a slot game that's well known to online casino players. 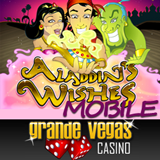 The new Aladdin’s Wishes mobile slot is a magical Arabian fairy tale theme game with a Free Spins bonus feature. The touch-screen version is designed especially for iPhone, iPad and Samsung Galaxy users. There are two bonus offers this week to celebrate the launch of the new game. Until May 31 you can claim a 100% up to $150 mobile casino bonus by using coupon code ALADDINMOBILE when you make a deposit on your mobile device. You can also claim 15 free spins on the new mobile casino game by using coupon code ALADDINSPINS when you deposit. Three or more Magic Lamp Scatter symbols triggers the bonus feature where players pick from five lamps to reveal prizes including up to 25 free spins or an up to 100x bet multiplier. All wins are doubled during the free games feature. “I love being able to cuddle up in a comfy chair with my iPad to play my slots, instead of having to sit at my desk,” said one Grande Vegas Casino player that’s playing more on her tablet than on her desktop these days. 14 of Grande Vegas' most popular games are now available in its mobile casino.